The festivities of Karneval dates back to the Middle Ages and the celebration of Carnival (Karneval or Fasching). The word stems from the Latin “carne vale” (without meat) and is the European relative of the Mardi Gras tradition of eating, drinking and merriment before the fasting season. After this festive celebration begin the solemn days of Lent. This colorful festival takes place 52 days before Easter and ends with a celebration before Ash Wednesday. Germans celebrate Carnival in several different regions and ways throughout Germany. The three most popular versions are Karneval in the Rhineland region, Fasching in Southern Germany and Fastenacht in Baden Würrtemberg. All three have different histories and roots, and all are quite fun! Carnival season officially starts much earlier, on November 11th at 11:11 am. At this time, people celebrate the beginning of what is often referred to as the “fifth” (Carnival) season. In the weeks leading up to the festivities, Carnival clubs meet to discuss upcoming performances, costumes, and parades. Cologne is the undisputed Carnival capital of Germany, followed by Düsseldorf and Mainz. In these cities, Carnival traditionally kicks off on Thursday with a “Women’s Carnival” (Weiberfastnacht). On this unofficial holiday, women dress up in costumes and misbehave in harmless ways and symbolically take control for a day. A popular tradition is to cut off men’s ties and leave only a short stump of this token of masculinity. In return, they usually reward their male victims with a peck on the cheek. The Monday following Women’s Carnival is called Rosenmontag or Rose Monday. This day marks the peak of Carnival season, with 11:11 a.m. as the official kick-off time for popular parades. No parade is larger than in Cologne. With excitement and anticipation, over 1 million people line up along the main street. Here they wait for the parade to pass by, which takes almost five hours! Over 11,000 active members of local Karneval clubs march in this 4 mile parade. All dress up as clowns, witches, wizards, or in military uniforms fashionable during the times of Napoleon. That’s when the parade in Cologne first started, in 1823, after Napoleon had been defeated in Europe and French troops had withdrawn from the Rhineland. The “Rose Monday” floats in the parade are works of art and portray a variety of themes. They usually focus on what is happening in the world at the time of Carnival. For example, a float may make fun of a contemporary government leader or a recent political event. After the parade, wild and free-roaming marchers dressed in crazy costumes (Narrenkostümen) gather in the side streets to continue the celebration. Bars remain open through the early hours of morning, and the spirit of Carnival reigns in the streets and public squares! Both in offices and at home, and above all in places for dancing and drinking, people celebrate! The next day, Karnevalsdienstag (Shrove Tuesday), marks the last day of the carnival season. People observe this day with smaller parades and parties throughout Germany. Carnival enthusiasts in other parts of the world, however, know this day not as Shrove Tuesday, but as Fat Tuesday or Mardi Gras. In fact, this day marks the highlight of the carnival season in many places! Cheerful and colorful crowds take over the streets with spectacular parades in cities such as New Orleans, Venice and Rio de Janeiro! In the Southwest of Germany, along the French Border in Baden-Württemberg, Western Bavaria, the Alsace region, Black Forest and Switzerland, lie the roots of the Allemannische Fastnacht. This season starts on Three Kings Day, January 6 (Epiphany). This dates back to the Alemanic tribes of the first millenium A.D. and are more subdued. 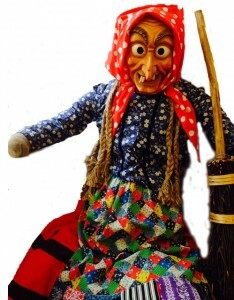 Costumes have evolved around themes of dark ghosts representing the cold season. However, they are then contrasted by the bright, colorful and happy spirits of spring! These traditional themes symbolize the eager anticipation of the growing season, a time farmers and consumers long for. It’s the day of reckoning and atonement for all party jocks and Carnival revelers. The “Season of Fools” has come to an end. For many Christians and non-Christians, it’s the start of the 40 day repentance and fasting period. Good bye to candies, Koelsch beer and costumes. Hello to lean and healthy herring dishes, meatless meals, and mineral water. many traditional neighborhood pubs and symbolizes all those little sins that Carnival fans committed during wild days and nights of the past week. The booze, kisses with strangers, the occasional fling, the headaches and hangovers all come to roost and repentance is required. So, all sins are forgiven when the “Nubbel” is burned. If you happen to be in Cologne or other German Carnival capitals, here is where you’ll go. To accompany this great fun, street vendors offer simple German fare to keep Carnival enthusiasts happy. On every corner one can buy fresh pretzels, hot sausages (Bratwurst) or Krapfen, the German answer to donuts. They may also enjoy mugs of hot-spiced wine (Glühwein), which helps the Carnival crowd stay warm! Finally, try a tasty Rosehip Jam! 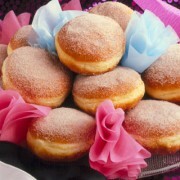 These jams are delicious and are oftentimes used to make donuts and other sweets for Karneval!